INTACH is calling for entries for the 2nd edition of its Heritage Awards. 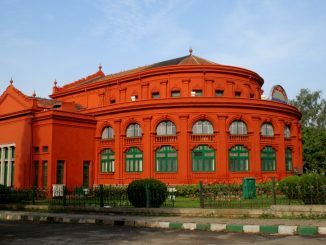 If you know of old buildings in Bengaluru which deserve to be recognised, don’t miss nominating them. While waste management and rejuvenation of lakes have found space in the budget, announcement of Commuter railways has cheered many. Formation of Ground Water directorate and Indian Institute of Public Health are the other things to look forward to. I think what BMTC has done was a cheap publicity stunt. They may argue that they gave an opportunity to the “less blessed children of God” ( I am afraid to call them any other name) to travel in luxury as an one time luxury. This sad experience will prove that we Indians are rotten to the core, and only a stick or a lathi is the only way to bring them to some level of awareness. You can look at anything that is called “public utility” which are damaged, tortured, raped, urinated, and kicked by them. Eighteen years ago, I was part of the team who introduced VOLVO intracity buses for Dubai Municipality (with 16 buses and now they have over 400). Earlier they had normal average interacity buses imported from India and USA, but a majority of them were in the workshop, most of the time due to breakdowns and non availability of spare parts. The Taxi drivers were making a fortune from construction workers and other labour so the Dubai Govt: stepped in to provide air conditioned luxury buses with unique suspension system with “mid mounted” 10 lit engine (against 7 lit rear engine with BMTC) and independent engine driving the AC system. It was a grand success with “low earning expats” in the beginning, but became ultra popular with executives and business men. Today Dubai City has the best intra city transport system at much lower cost per passenger km. With over 67% of the city’s population are expats from Asia, their buses should have been in the junk yard by now if we consider BMTC’s experiment as an example.But the passengers in Dubai City buses know, if they indulge in such shameless activities they will not only put behind bars or even deported by the next flight. I am happy that no political party or leaders so far asked for a percentage of seats to be reserved for hooligans, or in the name of castes, religion, or demography. Long live BMTC, Karnataka,but not the hooligans. Pretty sad to read that there’s been some small damage to the Volvo buses. I don’t fully understand or support the BMTC’s pseudo-humanitarian cause of allowing people with low incomes to enjoy the comforts of a Volvo. Is this going to transform thousands of people into harder-working, thirsting-more-for-success yuppies? I don’t think so. You can never take someone from the bourgeois class and expect that person to even know how to enjoy luxury. It will be beyond his/her scope of things. That thirst for the better life develops slowly, as a person makes his/her ascent into higher economic brackets. Hell, I’ve been desperately wanting to drive a Lamborghini and charter planes at the drop of hat. I don’t think even the most philanthropic of billionaires will just allow me to use his Learjet for the cost of a Go Air ticket. Then again, I might be wrong. Rotten tomatoes, anyone? Thanks Jay K 🙂 for your comment on the cartoon. I agree with Purnima about public themselves don’t care for p.property. Public property too does not care for public (like jutting out electricity wires etc.) Regarding misusing facilities it is even more apparent: garbage bins are kept artifacts; garbage is all around the bin except in it. What will garbage bins think? How will they feel? Sad. Terrorists seems to be using them well, though. Cheers. Why blame only public servants- the public themselves don’t care for public property. It was a good initiative by the govt, but namma public know only how to misuse facilities. Freebies don’t work in our society. I thought the 1 re scheme was a good idea. Understandably done to popularise the Vajra buses. But I think it would have been a better idea to reduce the fares nominally, not drastically and present them as an alternative to the erstwhile luxuries, aka Pushpak buses. Our public servants think only about publicity not caring about public property. Anyway all expenses will be borne finally by the poor public so why should they care. …Good idea to put cartoons, eyecatching. Perhaps to give a one time experience to those who cannot afford it. For example some heritage sites have a day when entrance is free (usually the least in-demand days)…. 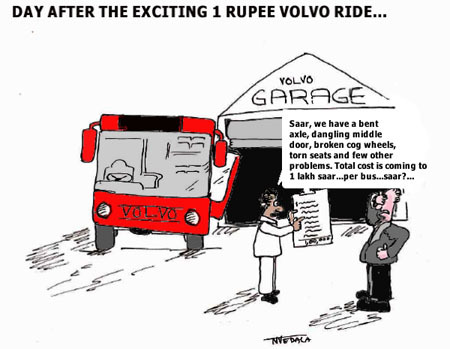 BMTC could provide the 1 re facility every Sunday afternoon; that way people can enjoy the Volvo for an outing with their entire families. …And those who want to avoid the crowds can afford to do so. Read this, too, and still wondering what on earth possessed the BMTC to open the Vajra buses to a section of commuters who certainly will not be using them again.